Mango again...a versatile fruit... can be eaten fresh, make into mango chutney, mango salsa, mango salad or mango kerabu, mango cake, mango pudding and mango jelly.... The original recipe uses mash pumpkin (recipe courtesy ~ my good friend, Samantha Tan from Melbourne). Its a crowd pleaser... easy to make. Mix the pureed mango with coconut milk and a pinch of salt in a heatproof jug. In a saucepan, add water, agar-agar powder and sugar. Bring to boil until agar-agar powder has dissolved. Remove from heat and pour in the mango mixture. Stir well. and pour into a square mould or any mould... leave it to set. 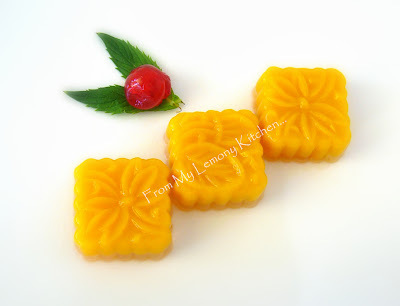 Once it is 3/4 set, make some grooves (lightly) on the surface of the semi set mango jelly. Optional: add slices of mango on top of the semi set jelly. 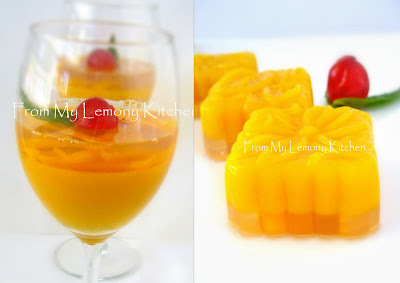 Right...Konyaku jelly mould... notice the layers ~ swap? shall I call it DownUnder Mango Jelly? Very interesting! Another to do for me!